It often amazes me what kids are able to learn in this day in age at 11, 12 13 or 14 years old. It’s even more impressive when they spell words that some of us may not even have heard of let alone be able to get out the proper spelling of a word. Tonight, it was an all Dallas and North Texas final in the Scripps National Spelling be at the Gaylord National Hotel outside of D.C, with Karthik Nemmani of McKinney winning the Thursday night in a competition that saw North Texas students finish 1-2-3 after three days of tough competition. For the first time in the history of the bee a competitor did not have to win a regional or state competition to advance to the finals, but through the RSVBee, which opened the competition to a new level this year, which had over 500 competitors, a record number. 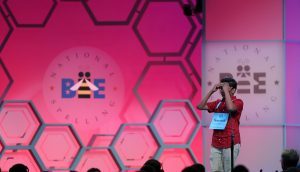 In their county spelling bee, Naysa won, but Thursday, Karthik came out on top — successfully navigating through words like “aver,” “paucispiral,” “ankyloglossia,” “haecceitas” and finally “koinonia” to win the Scripps National Spelling Bee.